Is the owner and veterinarian of Southern Animal Hospital, grew up in the Raleigh area on her family's small farm. Her family always had a menagerie of animals around, ranging from dogs and cats to horses and guinea hens. She grew up fox hunting, participating in 4-H and Pony Club, working in her family's grooming shop, as well as showing her horses and dogs. Her love of animals that began as a small child has continued today. After attending UNC-Chapel Hill for a degree in Biology, Boo graduated from NCSU College of Veterinary Medicine in 2008. After graduation, she moved to Northern Virginia to complete an internship and then worked two years as an associate veterinarian at The Piedmont Equine Practice. 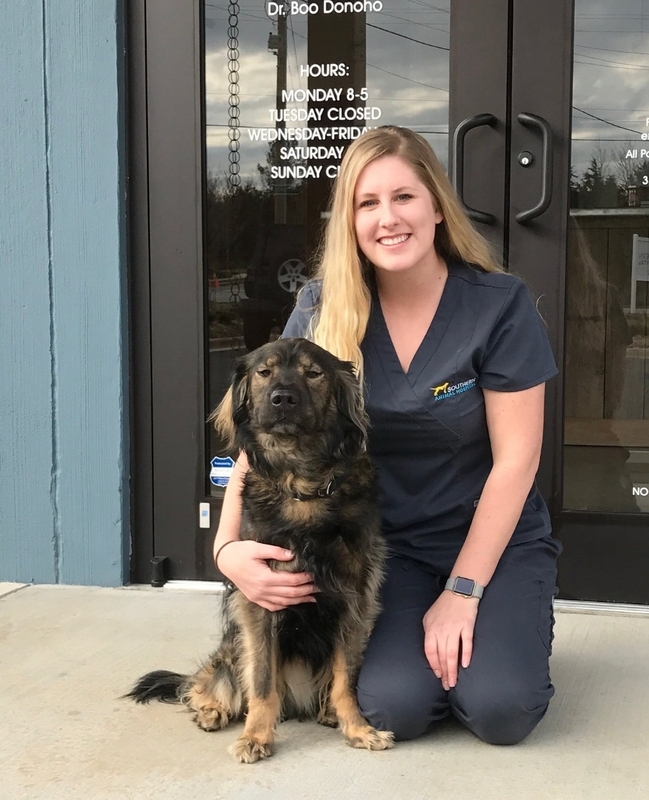 Boo then worked at small animal veterinary clinics in Northern Virginia, before deciding she wanted to move back south to be closer to her family, as well the warmer weather! She purchased property in Mebane in March of 2016 and with the help of her family and friends built Southern Animal Hospital. Training her Belgian Tervuren Salza, and her Rhodesian Ridgeback Tilly, in a variety of performance events including conformation, agility, obedience, rally, herding, scent work, and lure coursing keeps her busy. In her spare time, she also enjoys hiking and rehabbing houses with her family. She is a member of the American Veterinary Medical Association, American Veterinary Society of Animal Behavior, Veterinary Information Network, American and Blue Ridge Belgian Tervuren Clubs, Triangle Herding Club, and Durham Kennel Club. She lives in Mebane with her boyfriend Adam and their three dogs. Having grown up surrounded by animals, Boo has developed a strong interest in behavior. Her goal is to make every vet visit as comfortable as possible for her patients and clients. In addition, she has a special interest wellness/preventative medicine, critical/emergency care, and sports medicine. Jordan was born and raised in Burlington, NC. She earned her BS in Health Promotion and Education with a concentration in Pre-Health from East Carolina University and graduated in 2015 from the Veterinary Medical Technology from Central Carolina Community College in Sanford and became a Veterinary Technician that same year. Jordan has been working in the veterinary field for many years; including emergency medicine. In her spare time she enjoys riding her horse, Forrest or playing with her two mixed breed dogs, Chubz and Marco as well as her two cats Bacardi and Firefly! Hi, I am Trouble The Cat! You might have seen my adorable pics on Facebook and Instagram and wondered about my story. I am the most important team member at Southern Animal Hospital in Mebane, North Carolina! And boy do they need me to keep everyone in line! But my story starts before I became a Mebanite. I was probably born around May 2016. I don’t remember much about my first home, but at my second home I was just a little kitten and had to live outside. But I am not scared of anything and that got me in trouble. I was hit by one of the big, fast moving things humans like to ride in. Thankfully my owner brought me to see Dr. Boo when she was working at All Paws Pet Emergency. I was pretty sore, but still happy and purring with all of the attention they gave me. They told me I had a broken femur-not sure what that means except it slowed me down for a while-and my tail would need to taken off. My owner tried but couldn’t care for me. So I got to go live with Dr. Boo until I was feeling a little better. During this time, Dr. Boo realized I couldn’t eat normally. I was always so hungry! But everything I ate came right back up-that’s ok it tasted great the second time too! Everyone thought I must have something wrong from my accident. But after consulting with lots of smart people, they realized I was born with this problem. Someone mentioned big words like megaesophagus and vascular ring anomaly. Not really sure what all of that means except now I get lots of meals throughout the day and I eat really yummy canned food! I have these guys well trained to feed me. I spent some time at Pittsboro Animal Hospital trying to find my new home and I loved their rabbit BunBun. I even had a new home with another bunny friend for a while, but I loved the rabbit pellets too much. I can’t understand why something so yummy made me so sick. When Dr. Boo opened her animal hospital, I got to come back to her. They talked about adopting me out, but I made myself so irresistible they just couldn’t do it. I mean who doesn’t want a cat that can climb to the top of the cages and cabinets, helps clean the trash cans out, and sometimes rearranges their medications! I am having a blast learning new tricks. They tell me if I learn enough tricks I can be famous one day. Not real sure what that means either, but I hope it means I get more food! I already know how to sit, spin, come (this one is hard sometimes when there’s so much exciting stuff to see), and high five. I have fun doing something they call agility, weaving and going on a teeter. Everyone keeps saying how smart I am-all I know is I get yummy cheese when I show off my tricks. Some days when I am feeling lazy you can find me sleeping in the office with my dog buddies-of course I always take the biggest bed. Those dogs need to know who is the boss! Look for me on Instagram and Facebook!